If there’s one thing more revealing than a tweet, it’s a deleted tweet. After Nigeria announced on Sunday that its economy had nearly doubled, soaring to US$509 billion and overtaking South Africa’s gross domestic product (GDP) by a hefty 60% to become Africa’s largest, there was a flurry of tweets from South African officialdom. They did not mention Nigeria directly. But it was clearly implied as they pointed out that South Africa (still) had the largest stock exchange in Africa by far, the best-regulated financial systems and the best infrastructure – and good security. It also has one of the most diversified economies. An obvious comparison with Nigeria’s heavy dependence on oil, this last observation was the clincher. In Nigeria particularly, it said, South African firms had played a big role in the growth of the wholesale, retail and telecommunications sectors. ‘This is a positive story of African countries contributing to re-shaping each other’s economies through increased investment,’ the Treasury stated. So that was the official line. Minister of Trade and Industry, Rob Davies, elaborated on that line, telling Business Report that Nigeria’s rise was good for South Africa, because the latter’s future was inextricably linked to that of the rest of the continent. He noted that South Africa was involved in several potential projects to help Nigeria industrialise, particularly to launch an automotive industry by supplying components. Davies said Nigeria’s move to the top spot might enhance the country’s ‘claim to be seated at various tables’ including the G20, where South Africa is currently the only African member. Davies even suggested that South Africa might now lobby for Nigeria to be given a seat at those tables – alongside and not in place of South Africa, presumably. Unofficially, the reaction to Nigeria taking the top spot was rather different, as those deleted tweets suggest. Some officials suggested Nigeria’s rebasing was a bit of a 419 scam, saying that it was not an objective process. They pointed out that it was not being peer-reviewed as it ought to be, and as had happened with the rebasing in countries such as Ghana and South Africa in a process led by the African Development Bank. They further suggested that a recent comparison of African GDPs, calculated on a purchasing power parity basis (which removes exchange rates from the equation to reveal real costs) put Egypt at number one, South Africa at number two and Nigeria at number three. There may have been a hint of this even in the Treasury statement quoted above, which, on closer inspection, says Nigeria had become the largest economy in ‘sub-Saharan’ Africa – not Africa as a whole. The contrast between the official line and the deleted tweets probably reflected, in part, that lack of smooth coordination in policy formulation and presentation that besets all governments – and particularly this one, it seems. But the differing responses from various quarters of the South African government also reflected the different perspectives of various departments. It was significant that only two economic departments – Treasury, and Trade and Industry – commented officially on Nigeria overtaking South Africa. Economically, this development is easier for South Africa to swallow, as the Treasury statement and Davies’ remarks made clear. It is also, however – as several economists have said – a loud wake-up call to the government to clarify the policy ambivalence and labour unrest that are discouraging investment. This week, the International Monetary Fund (IMF) revised its forecast of GDP this year downwards from 2,8% to 2,3% – well below Pretoria’s forecast of 2,8% – largely for those reasons. Geo-politically, Nigeria’s ascent is evidently a less palatable development. Despite the hint of an offer by Davies to help seat Nigeria at international bodies like the G20, many on the diplomatic side of government do not relish that prospect. For one thing, they fear it could jeopardise South Africa’s membership of bodies like the G20 and also the Brazil, Russia, India, China and South Africa (BRICS) grouping, because that is premised largely on South Africa being ranked number one. Even sharing the table is a problem for some in the Zuma administration, which has been notably more assertive and competitive in Africa than its predecessors. And in doing so, it has bumped up against Nigeria in particular. It was President Goodluck Jonathan who most vigorously opposed Pretoria’s campaign to get Nkosazana Dlamini-Zuma elected as chairperson of the African Union (AU) Commission two years ago. He also took diametrically opposite views from Zuma’s on the conflicts in Côte d’Ivoire and Libya. The two clashed again when Zuma opposed Jonathan’s proposal that the AU re-instate Guinea-Bissau’s membership, which had been suspended because of its coup. And again at the AU summit in January, when Nigeria put the brakes on the African Capacity for Immediate Response to Crises (ACIRC), Zuma’s project for a rapid response force to be formed by coalitions of the willing. This friction reflects not only normal big-power competition; it also has an ideological edge. 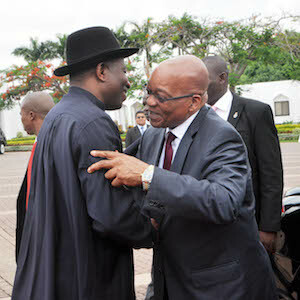 In the Libyan and Ivorian conflicts, particularly, South Africa felt that Nigeria was toeing the Western line. It was because of its concerns about such deference to Western interests more generally, that South Africa put up Dlamini-Zuma for the top African job. One can expect this competition to become more intense now that Nigeria is officially the top dog.